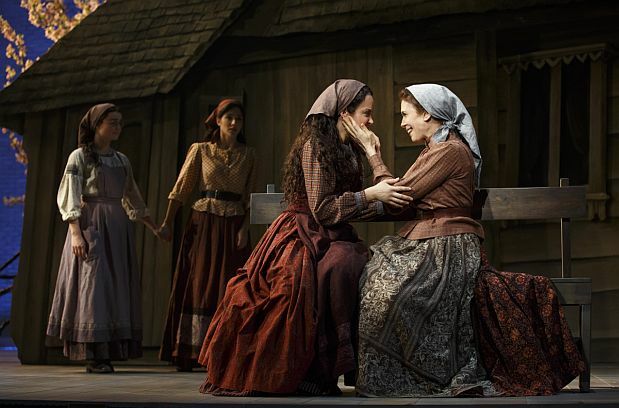 I fell in love with Fiddler on the Roof when, at thirteen, I heard the original cast album; by the time I saw it on Broadway I knew the wonderful Jerry Bock-Sheldon Harnick score by heart and I’d read Joseph Stein’s libretto through several times. (Those were the days when Random House regularly published new playscripts in deluxe hardback copies furnished with production photos.) Zero Mostel had already been replaced in the role of Tevye by the distinguished Group Theatre alumnus Luther Adler; I caught it again on the road a few years later with Herschel Bernardi. In my senior year at college Norman Jewison’s movie version came out, with the robust, warm-toned Israeli actor Topol in the starring role. It managed not only to reproduce the glories of the stage version (including, of course, the Jerome Robbins choreography) but to make a link, in the final moments, to the next chapter of the story of the Jewish diaspora: the exiles from the Russian shtetls, borne away on a raft in the film’s most exquisite image, would be the first generation of Jewish-Americans. In his magnificent new Broadway revival, Bartlett Sher tries to make the leap to the twenty-first century by bookending the show with his leading man, Danny Burstein, in a parka reading from a book about the Jews of Anatevka before – and after – he dons the hat and prayer shawl of Tevye the dairyman. This frame is meant to situate the story in the larger one about refugees that is still, of course, with us. But it’s too vague to work and frankly, why would you want it to? If you felt the need to imply that the narrative of Fiddler on the Roof is only one chapter in a broader story, then the direction you’d have to head in would lead to the Holocaust – and that would be a truly terrible idea. The subject matter of the musical is rich enough; it doesn’t need generalization. Its great virtue is its specificity. If Fiddler on the Roof is deep in your consciousness, as it is for many theatregoers, then what you tend to focus on here are the surprises in the production. Burstein, whom Sher has worked with many times and always to their mutual benefit, is the most understated Tevye I’ve ever seen, and his performance of “If I Were a Rich Man” is soulful without being extravagant; when he sings about the “sweetest thing of all” in his fantasy, the chance to take his place among the most learned Talmudic scholars, he shakes his head, eyes half-closed, reluctantly letting go of his fantasy as he comes back down to earth. This production implies more intimacy among the three eldest daughters than we usually see. Both Hodel (Samantha Massell) and Chava (Melanie Moore) are aware of the feelings the eldest, Tzeitel (Alexandra Silber), harbors secretly for Motel the tailor (Adam Kantor), and when Yente the matchmaker (Alix Korey, working subtly against the Yiddish-music-hall tendencies of the character) arrives to talk to their mother, Golde (Jessica Hecht), they see how her presence upsets Tzeitel; “Matchmaker, Matchmaker” is meant to console her. 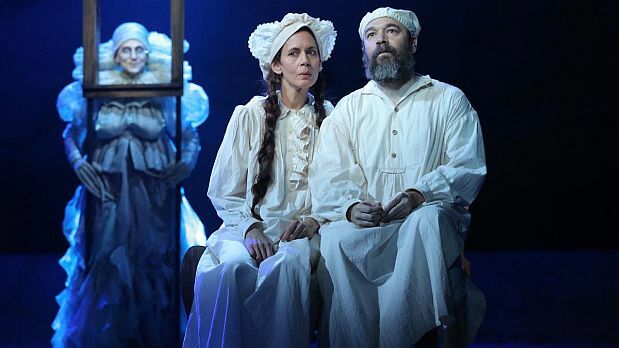 In the second act, Tzeitel, now married with a baby, is furious at Chava for allowing a non-Jew, Fyedka (Nick Rehberger), to court her behind their father’s back; though Tzeitel’s pledging her troth to Motel has marked the first attack on tradition in Tevye’s household, she turn out to be the most conservative of the three marriageable sisters. Hodel, of course, falls in love with a revolutionary, Perchik (Ben Rappaport), and Chava weds out of the faith. The period costumes accentuate the angularity of Jessica Hecht’s face; she’s never looked more beautiful on stage. She gives Golde a sternness that isn’t softened by the usual obvious folk-fable humor; she refuses ever to sentimentalize the character, even during the “Do You Love Me?” duet with her husband, and the integrity of her acting – her refusal to make Golde lovable, like an obstinate housewife on a sitcom – is a real gamble. I think Hecht is superb, especially in the scene where she brings Tevye the news that Chava has eloped with Fyedka and her sorrow is so heavy that she sinks down to her haunches. Hecht earns the emotion in that moment the hard way. The Chava episode tears you apart, as it should. When Moore performs “Chavaleh,” which represents her father’s fond memory of her growing up – in terms of design, it’s the sparest scene in the show – she dances upstage of a scrim hung like a clothesline. At the end of the number, she pulls the scrim back when the present-day Chava, breaking into his reverie, confronts him, begging him to listen to her explanation for what she’s done. But he refuses to hear her: he seals her out by dragging the scrim back across the stage. This is a real staging coup, enhanced by the sensitivity of the two actors. Silber doesn’t have a wide expressive range, but she’s lovely and well cast as Tzeitel; playing opposite her, Kantor draws on expert comic timing and does some clever things with Motel’s jumpiness. In the movie version, Rosalind Harris and Leonard Frey played these characters, as the critic Pauline Kael pointed out, like Shakespearean lovers; here the romantic comedy shifts to Hodel and Perchik’s relationship. Rappaport has such an appealing virility in the first act that it’s a bit of a letown when, in the second, he loses some of his color and offers a stock rendition of “Now I Have Everything,” but that song has always been bland. By contrast, Hodel gets “Far from the Home I Love,” perhaps the most lyrical song in the score. Massell plays the character with backbone and resilience. Several of the supporting players find more latitude in their roles than you might have guessed was there, like Adam Grupper as the Rabbi and Karl Kenzler as the Constable. And as Lazar Wolf the butcher, who makes an agreement with Tevye for Tzeitel’s hand and then finds himself shoved aside for Motel, Adam Dannheisser is a revelation, and Sher assists him by widening his character in the staging. We get a sense of his bruised feelings (especially at the wedding), and when Tevye invents a dream to persuade stiff-necked Golde that their daughter should marry Motel – after he’s already let the lovers talk him into it – Lazar, wearing his blood-stained work apron, makes an appearance in it, as if nagging at Tevye’s conscience. (The Fiddler, delightfully played by gnomish Jesse Kovarsky, makes an appearance too, emerging out of a chiffonier at the beginning of this joyous, expansive number, which Zuber has costumed with a distinct Bread and Puppet Theater influence.) Lazar is the richest man in the shtetl; one of the reasons Tevye, who has never cared for him, originally agrees to the match is that he knows his daughter will live a comfortable life with him. At the end, when the Jews have to pack up to leave Anatevka, he comes by to bid Tevye farewell, and Sher gives him a lovely touch of generosity: as he walks off he slips a couple of bills into Tevye’s wagon, unnoticed. The “Anatevka” number, the Jews’ response to the news that they have to move on, begins in a rueful, darkly humorous tone, the self-deprecating jokes about the insignificance of this threadbare place laying a veil tenderly over the wound. I can’t imagine how any performance of this song could improve on this one. A few minutes later is the scene where Chava and Fyedka come to say goodbye and Tevye does the best he’s capable of by way of a reconciliation with the daughter he’s declared is dead to him – he cues Tzeitel to tell her, “God be with you.” Sher’s intricate staging of the scene underlines its complexities and coaxes all the layers of feeling out of the text. This is a great rendering of a great American musical. Last weekend’s revival of the show in the Encores! series at City Center, with new orchestrations by Jonathan Tunick (the originals were nowhere to be found) held some interest for musical-theatre geeks like myself who have always been curious about how the play differed from Minnelli’s movie version – but not, I would imagine, for anyone else. It turns out that the screenwriters, Joseph Schrank and an uncredited Marc Connelly, were quite faithful to Lynn Root’s book (the only major change in the film is the ending). The story is a simple one. When “Little Joe” Jackson is slashed up at a local gambling joint by a badass who catches him using loaded dice, only the fervent prayers of his devout Christian wife Petunia keep him from becoming the property of The Head Man, Lucifer’s son. Lucifer Jr. and The General, the Lord’s representative, strike a deal to send Little Joe back to earth and give him six months to either change his backsliding ways or be remanded to hell. The Head Man and his associates keep putting temptation in Little Joe’s path, in the form of a winning sweepstakes ticket and a local vamp named Georgia Brown, but he follows his conscience (the voice of The General) – until Petunia, under the misapprehension that he’s been cheating on her with Georgia, walks out on him. Someone ought to have been able to whip up some raucous energy with this playful, stylized material, but the Encores! production was stillborn. The main problem was Ruben Santiago-Hudson’s static direction. The Head Man (Chuck Cooper) sat downstage right, surrounded by his minions, while The General (Norm Lewis) and his crew sat downstage left; the chorus sat on upstage benches, and most of the time the principals sat center stage. That’s a hell of a lot of sitting. Couldn’t Santiago-Hudson at least have placed The General up near the orchestra (conducted with his usual panache by Rob Berman) to give the stage picture some height variation and a little less symmetry? At the rare moments when the cast got up on its feet, Santiago-Hudson stuck the in a straight line. The musical only came alive in the dance numbers, thanks to Camille A. Brown’s choreography and the enthusiastic participation of some talented dancers. (Hollie E. Wright and Willie Smith III were the standouts.) The songs were rendered proficiently by singers with fine vocal instruments but, for the most part, not much personality – Norm Lewis, LaChanze as Petunia, Carly Hughes as Georgia, Marva Hicks as Petunia’s neighbor Lily. (Karen Perry’s chintzy costumes certainly didn’t help the women in the cast.) There were a few exceptions, like Michael Potts as Little Joe – the part Dooley Wilson created on stage and Eddie Anderson picked up in the Minnelli film - and Forrest McClendon in the non-singing role of Dude, one of Joe’s bad influences. The fireball Chuck Cooper brought some much-needed showmanship to his numbers (including “Little Papa Satan,” a duet with Potts that was cut from the original Broadway version), but he could have used a stronger director who might have urged him to ease up on the mugging. 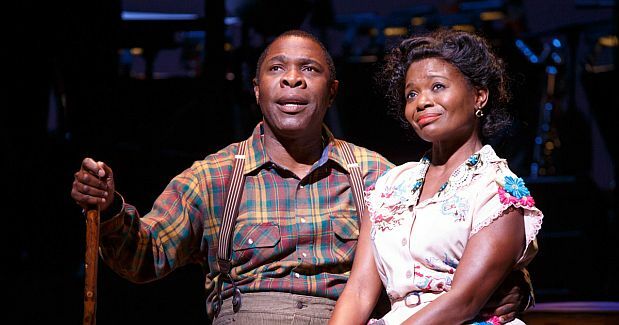 Since the musical sits squarely on Petunia’s shoulders, LaChanze was the biggest disappointment. The towering Ethel Waters had one foot in gospel and the other in the blues, and she was a sensational actress. In the movie she brings a soulful sweetness to her ballads, but when she shows up at Joe Henry’s joint in the climactic scene, decked out in a flamboyant gown, she’s the same Cotton Club jazz baby who put over “Am I Blue?” and “Birmingham Bertha” with such cheeky sensuality in the early talkie On with the Show. LaChanze sang her numbers lyrically – especially “Happiness Is Just a Thing Called Joe,” which Encores! wisely borrowed from the movie – but her Petunia never made it out of the choir. She wasn’t convincing and neither was the production.